Westlake town home located in Cobblestone at Plantation Bay with views of preserve. 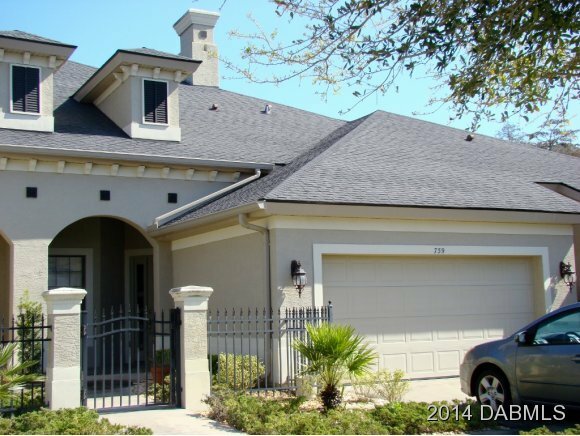 This two story unit features living room, dining room, den, kitchen and master suite, half bath on the first floor, with bedroom 2, bath 2, and loft/family room up. This home has a covered lanai and oversize two car garage. Town home is subject to Flagler County property taxes and Tomoka CDD fee, plus sub HOA of $192per month.Plantation Bay features 45 holes of championship golf, two club houses, spa and fitness center with two pools, 10 lighted Har-Tru tennis courts. While membership is optional, buyers of this home qualify form substantial discounts toward initiation fees to Plantation Bay Golf and Country Club provided members join within 30 days of close. Discounts apply upon application approval. Based on information from the DABMLS from 2019-03-21 12:08:34. DABMLS and their affiliates provide the MLS and all content therein "AS IS" and without any warranty, express or implied. Data maintained by the DABMLS may not reflect all real estate activity in the market.